In this lesson, we will learn how to calculate the momentum of a particle of mass m moving in a straight line with velocity v by using vectors. A body of mass 7 kg is moving in a straight line. Its position vector at a time 𝑡 is given by the relation ⃑ 𝑟 ( 𝑡 ) =  𝑡 + 5  ⃑ 𝑖 +  𝑡 + 𝑡  ⃑ 𝑗 2 3 , where ‖ ‖ ⃑ 𝑟 ‖ ‖ is measured in metres and 𝑡 in seconds. Determine the body’s momentum after 2 seconds. 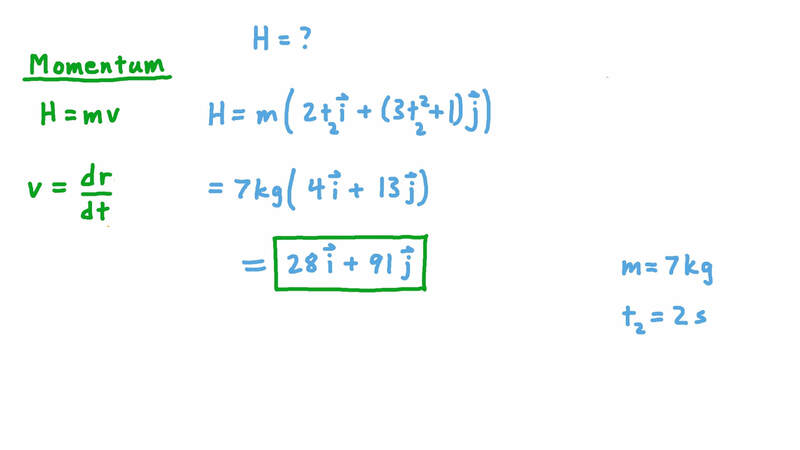 A body of variable mass is moving along a fixed straight line. Its mass at time 𝑡 is given by the relation 𝑚 ( 𝑡 ) = 5 𝑡 + 7 and its displacement is given by the relation ⃑ 𝑠 ( 𝑡 ) = ( 5 𝑡 + 4 𝑡 ) ⃑ 𝑖 2 , where ⃑ 𝑖 is a unit vector parallel to the direction of its motion. Determine the body’s momentum ⃑ 𝐻 ( 𝑡 ) and the force that is acting on it ⃑ 𝐹 ( 𝑡 ) . Determine the mass of a body whose momentum is 37 kg⋅m/s, given that its displacement vector is given by the relation s i j ( 𝑡 ) = ( − 3 𝑡 ) + ( 4 𝑡 ) , where | | s is measured in metres and 𝑡 in seconds. A body of mass 3 kg is moving in a straight line. Its position vector at a time 𝑡 is given by the relation ⃑ 𝑟 ( 𝑡 ) =  𝑡 + 5  ⃑ 𝑖 +  𝑡 + 𝑡  ⃑ 𝑗 2 3 , where ‖ ‖ ⃑ 𝑟 ‖ ‖ is measured in metres and 𝑡 in seconds. Determine the body’s momentum after 3 seconds.